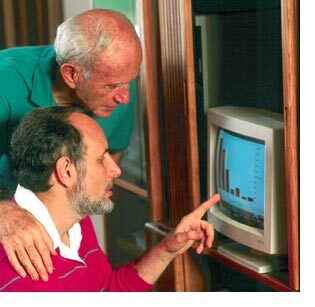 Martin Weiss writes : Before he passed away, Dad and I often got away from the office, compared Big-Picture numbers of the global economy, and sometimes questioned the prevailing worldview. Our conclusion: Probably since the Renaissance and certainly since the Industrial Revolution, the worldview of the West placed Europeans and their descendants at the top; Asia and its peoples near the bottom. But in the real world, that image is upside down. 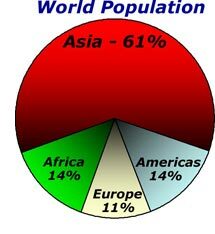 Just in terms of population, Asia dominates the globe — with an amazing 61% of all the people on the planet. In contrast, the Americas are barely tied with Africa for 14% of the world's population … while Europe's population is even smaller — just 11% of the total. China, which has long been one of our favorite countries for exchange-traded funds (ETFs), has continually clocked in with growth that's double and triple the norm in Europe and the Americas. Singapore, also an ETF we've recommended recently, has just spurted ahead at an annual rate of 7.2% in the first quarter — amazingly, more than two full percentage points higher then the consensus of economists polled by Bloomberg. India and Malaysia … Taiwan, South Korea and Japan … even the Phillipines, Indonesia and Vietnam … are also accelerating. Yet, despite Asia's long-known dominance in population numbers … and despite its increasingly obvious pre-emininence in economic growth … the image of "the West on top" still prevails. I was brought up with Japanese immigrants in Brazil … and with Chinese immigrants in the U.S. Then I lived in Japan and traveled to China. I learned Cantonese when I was 20, Japanese when I was 26 and Mandarin at 54. China was my favorite area specialty in college, and Japan was my primary specialty in grad school. I was the first American born analyst in the Japanese securities industry in Tokyo. I was the first to edit and publish a Japanese-language newsletter on global bonds. My opinion, guided by this experience, is simple: The predominant worldview has rarely been more misguided … and has never been more consequential. Among other factors, the misguided worldview helps explain why most of America's labor force has been unable to compete globally, losing millions of jobs to outsourcing in Asia. It helps explain why many of America's giant manufacturing companies — like Big Steel and Detroit's Big Three — have fallen so far behind their counterparts in Asia. For example, Tony Sagami, who's getting ready for a new trip to Asia next month, has recently told you about great bargains in Japan , highlighted fat profits in Asian hotels and given you four solid rules for success in Asian investments . Larry Edelson, who has just returned from Asia, has reported on fascinating investment opportunities in Malaysia , plus 13 more with Asian powerhouses . And look at Sean Brodrick! For many months, Sean has been hot on the trail of the one natural resource in the world that has clearly benefited the most from the Asian boom — uranium. The price of this energy-metal is now up from $10 per pound just four years ago to $113 per pound last week — a surge of 1,030%. 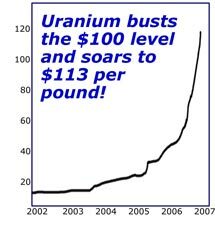 Its surge is setting off a chain reaction of explosions in uranium stocks, with one after another blasting off last week, and with two of Sean's more recent picks up at least 90% just since January. It's why the 6 uranium stocks he picked in October were up by an average of 106% by the end of last month … and why they're up even more right now. Plus, it's also why he has strong reason to believe that his new round of picks, which he's issuing tomorrow, could do even better. (See Sean's latest report for details). In terms of its economic and geopolitical impact, what we're seeing in Asia today is probably most akin to the Industrial Revolution, when the world's leading economies replaced manual labour with mass-scale manufacture of machinery … when railways began to criss-cross the continents … when the steam engine revolutionized the world … and later, when skycrapers first poked at the skies. And, as in the Industrial Revolution, there's one major resource that stands out as critical: Iron ore. Without iron ore, you cannot make steel. And without the steel, virtually all the new infrastrcture and all the world's construction would be impossible. Guess Who Is the Biggest Maker of Steel in the World! In 2003, China was far behind in steel production. It actually had to import more steel to feed its rapid growth than almost any other nation on the planet. 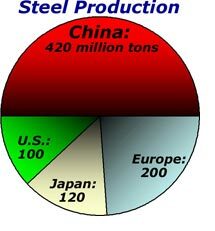 In 2006, China produced 420 million metric tonnes of steel. That's more than double the total steel production of 25 European countries (200 million tonnes) … three and a half times Japan's (120 million) … and over FOUR times America's (100 million). But given the current growth rates of steel production, the chances of anyone overtaking China any time in our lifetime is remote: Last year, for example, steel production in China soared 18%; while the U.S. steel industry was fortunate to grow by 6%. Meanwhile, China's steel exports have multiplied seven fold in just three years! So in addition to being the largest producer, it's also the largest steel exporter in the world. It's a heavy-weight in virtually every steel product category — long products, flat products, tubes … and in almost every market — Asia, Europe, North America and South America. For better or for worse, China is the undeniable steel king of the world. Does that mean you should invest in steel companies? If you follow Tony's Sagami's golden rule, absolutely not! In other words, get the heck away from the companies that sell the same thing as China's selling. It's unlikely they're going to be able to compete. So don't buy PC makers! And likewise, don't buy steel. Instead, buy the resources that China is buying — or the companies that provide those resources. Just as China has emerged as the world's steel-producing king, it has also become the world's iron-ore glutton. China needs the iron ore to make steel for its construction industry, now the largest in the world, surpassing expenditures of $120 billion annually. China needs the iron ore to help feed the new growth in construction — 20% in 2006, possibly as much as 25% in 2007. China needs the ore to build residences, highways, railroads, subways and dams. Result: Just in the first three months of this year, China imported 100.2 million tonnes of iron ore, an increase of 23.4% over the previous year. And if this pace continues through year-end, total imports for 2007 will easily exceed 355 million tonnes, a now-defunct forecast made not long ago by the China Iron and Steel Association. Looking over to India and into the future, the demand could be even larger. Right now, for example, India's consumption of steel is still less than 90 lbs per person. In China, by contrast, it's over 500 lbs, and in South Korea it's about 2000 lbs, or over 20 times more than India's! If India just closes that gap by a modest margin, it could double or triple its demand for steel, causing equivalent growth in its demand for iron ore.
No Wonder So Many Companies and Countries Are Scrambling to Secure Iron Resources! Steelmaking companies and countries all over the world are suddenly realizing that their long-term, iron purchasing contracts are not nearly enough. So they're in a panic to secure new supplies. And driven by its huge needs, China is leading the pack. China is locking down iron-rich resources in Australia, where China's Baosteel and Australia's Fortescue Metals Group Ltd (FMG) have signed one of the largest partnership deals in Australian mining history — to supply up to 20 million tonnes of iron ore per year. China is seeking to do something similar in Canada, Brazil, and wherever iron ore is found. This, in turn, is setting off a chain reaction of iron ore deals that China is not directly a part of. In Colombia, for example, Brazil's Votorantim recently bought 52% Acerías de Paz del Río, Colombia's second biggest steel maker, for $489 million. This means Votarantim now surpasses the giant Arcelor Mittal, as well as Brazil's own Gerdau and Companhia Siderurgica Nacional. The biggest plays: In the two countries with the largest iron ore reserves — Australia, which exports over $8 billion worth each year and Brazil, which exports over $7 billion. I'm looking at two companies that currently control massive amounts of iron ore reserves and are among the largest suppliers to China and the rest of the world. 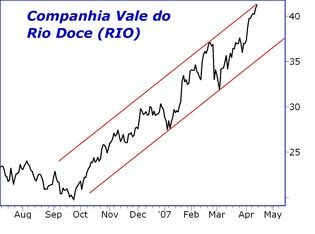 I'm personally more familiar with Brazil's Companhia Vale do Rio Doce (RIO) from my many years in Brazil. It's the largest mining and metals company in the Americas and the second largest in the world. It's the world's largest producer and exporter of iron ore and pellets, the second largest producer of nickel, manganese and ferroalloys, and one of the lowest-cost integrated producers of aluminum and copper. And recently, it has established a strategic alliance with Nippon Steel, one of the world's largest metal groups, to produce iron pellets and iron alloys. The company invests more money every year than any other company in Brazil, and in 2007, it plans investments totalling $6.3 billion, including $2.12 billion related to iron alone. 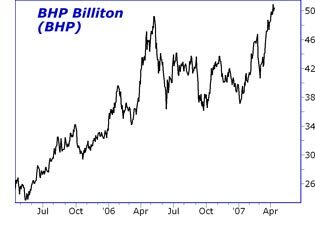 Meanwhile, on the other side of the southern hemisphere, BHP Billiton is the only non-banking firm among the Australia's five largest. Compared to RIO, its closeness to China and Asia is a minor strategic advantage; the greater volatility of its shares, a minor disadvantage. But overall, the opportunity is similar. My recommendation: Don't rush out to buy iron ore companies immediately. Wait for a pullback. Like Dad and I did years ago, first look the globe from a broad, sweeping perspective. Only then can you start to narrow your focus and your choices.